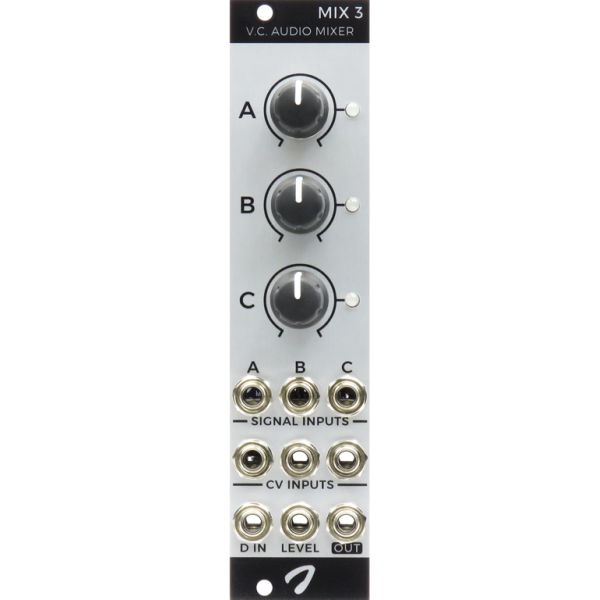 By combining a mixer and four VCAs in a single module, Mix 3 manages to provide a unique combination of compact size and functionality in just 6hp. High-end signal paths ensure extremely low noise and distortion, which is more natural for audio than linear, as it matches the human hearing. However, all signal paths are DC-coupled, so control voltage (CV) signals can be processed as well. What truly sets Mix 3 apart from other compact mixing modules are the three CV inputs, providing voltage control over the signal levels. This even allows you to go beyond unity gain and reach up to +20dB of amplification. Once a CV input is used, the corresponding channel knob becomes a CV attenuator. When clipping, Mix 3 does so in a clean, symmetrical way. This yields a very pure overdirven sound, only containing odd harmonics, and allows the module to be used as a triple voltage controlled distortion.